Centrally located on Lincoln Avenue in Export, just minutes from Monroeville, Blairsville, Apollo and Greensburg. We are nestled in a quiet, residential area with a country like setting, surrounded by off-street parking that accommodates more than sixty vehicles and a well-lighted portico for your convenience. 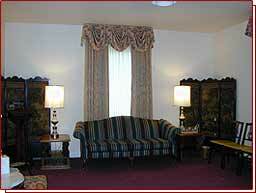 Our newly redecorated facility was tastefully done to offer a warm and comfortable atmosphere. Included in our home are two spacious viewing areas, a family room where folks may go to have time alone or to talk privately, a casket selection where a large variation of caskets are available along with a complete display of burial vaults. We have recently added to our lounge, an area where children may engage in learning activities, play or just watch T.V./videos while their parents receive friends or visit with the family. Next door to the funeral home is my residence. Along with my wife, Amy and son Erich, we can oversee all aspects of day to day operation of the business.